The Silk Garden Flower and Gift shop held its Grand Opening Saturday, October 12 and 13th. The Silk Garden located on the corner of Hwy 96 and Bloomington Street in Lomax, is owned and operated by Theresa Potter of rural Lomax. Her shop opened for business on September 28, 2007 and specializes in fresh and silk arrangements. In addition to flowers, the shop features soy candles, antiques, hand painted items, crocheted baby gifts, honey, jams, dishes and balloon bouquets. Displays are also available to be rented for weddings and showers. The Silk Garden offers the Teleflora service as well as custom orders. Delivery service is available within a 15 mile radius. Theresa Potter, owner and designer of The Silk Garden, is new to the Lomax area. She is originally from Argyle, Iowa and has four children, ranging in age from 19 to seven years old. She is engaged to Roger Farquhar of Lomax. They are planning a May wedding in Hawaii with an underwater scuba ceremony. 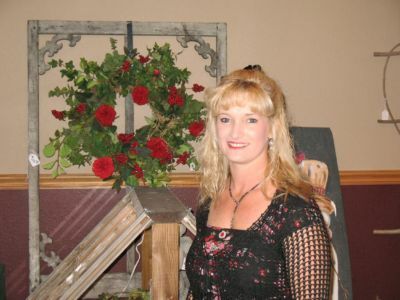 Theresa raises miniature horses and enjoys trail riding and barrel racing with her children. She currently has 18 horses and 13 miniature donkeys. Theresa takes her animals to petting zoos as well. She has been active in the American Cancer Society since 2005 after her late husband died of cancer. Theresa donates a miniature horse to the American Cancer Society in memory of her late husband, Craig Potter, from Olena, who later moved to Iowa. The horse is raffled off each year at the Ft. Madison rodeo. One of her special hobbies is scuba diving. Prior to opening her shop in Lomax, Theresa operated a flower shop called The Flower Potter in West Point, Iowa. She has been a floral designer for 22 years having worked at HyVee and County Market floral departments. Theresa plans to have another open house during the Christmas season. The Silk Garden is open from 10:00 a.m.-5:30 p.m. Monday, Tuesday and Thursday and from 11:00 a.m.-7:00 p.m. on Wednesday and Friday. It is open on Saturday from 10:00 a.m.-3:00 p.m. The shop will be open on Sunday by appointment. The phone number for the Silk Garden is 217-449-3999 during business hours and after hours at 217-449-3862.